HIROSHIMA - The Hiroshima Prefectural Government launched Wednesday what it called the country’s first local government-led initiative to provide free breakfast to elementary school students, officials said. The prefecture hopes to expand the program to other elementary schools wishing to sign up, citing findings that students who don’t eat breakfast perform more poorly on academic achievement tests than their peers who do. At Ajinadaihigashi Elementary School in the city of Hatsukaichi, 45 students gathered at around 7:30 a.m. to eat breakfast. The children said eating breakfast makes them feel ready for the day and that they enjoy eating together. Once a week neighborhood volunteers provide readily consumable foods such as bread and cereal, and companies partnering with the government offer the food for free, the officials said. “I was aware that there were some children who were not eating breakfast,” said Takanobu Sekiguchi, a 77-year-old volunteer. “This is also an opportunity for the local residents and the children to get to know one another,” he said. 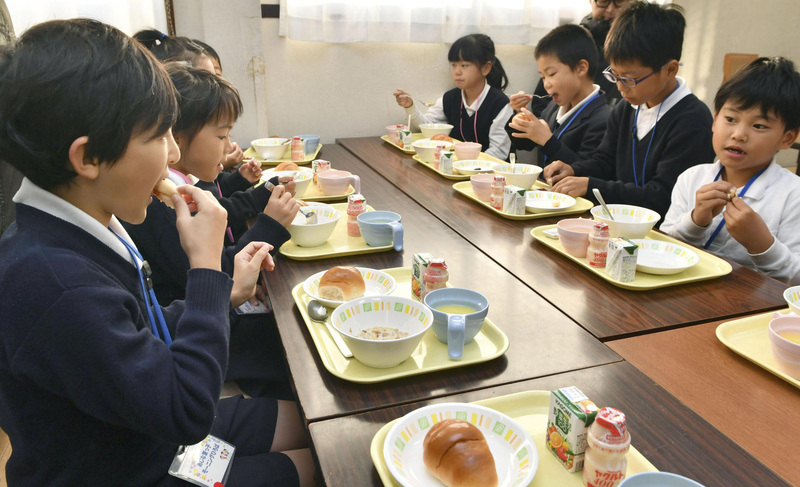 About 5 percent of sixth-graders across the prefecture skip breakfast and go straight to school, the officials said, reflecting the growing number of children who are unable to eat breakfast with parents who leave early for work. The prefecture will hold a similar initiative at two or three other elementary schools until March and evaluate its effectiveness.